This image is scarier than the movie! I had actually wanted to see Chernobyl Diaries. It looked scary. There were “bad things” in a spooky town that had plenty of reason to be spooky, and it had a certain “cheese” level. Last night, though, the scariest part was that the dollar theater didn’t have air conditioning. Stop reading now if you don’t want spoilers – although I’m not sure anyone could spoil it. The movie couldn’t figure out what was meant to be scary, so there was no focus on what was supposed to be scary. Was it dogs? Radiation? Mutant fish? Cannibals? Why the hell would the government keep the cannibals around? Especially if they keep getting out and eating guards? They obviously could capture and contain them, so why not just toss in some gas and kill them? Are they being kept as shock troops for a potential pending war? That would have been cool. But if that’s the case, why not kill those and then make more later? They missed chances to make it scary – when map was “wrong,” why not have them had been in building that wasn’t built yet? The pictures would show that they’d been in buildings, had seen things in buildings, but the buildings (at night) were just in construction. Again, ghosts are scary! Finally, my favorite (maybe?) part – a special forces guy with a gun can’t kill the cannibals, but the other characters can beat them off with a tire iron. Really? Are they afraid of the iron? I’m sure there’s plenty more that can be said, but I’ve already wasted too much time on this movie. And too much money. Sure, the tickets were only $1, but after a drink, popcorn, and cotton candy, we wasted a whopping $15. Who do I write to for a refund? 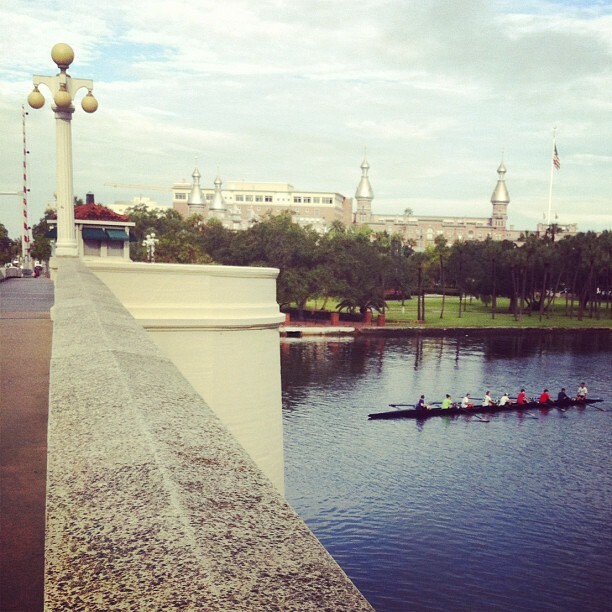 Leaving Tampa in just over an hour now. It seems like the past ten days have flown and dragged. It was like an entire semester compressed into those days, with no time to live or breathe. So sitting here and thinking I’ve got four months of work ahead of me is crazy. Had an excellent experience last night at what bills itself as the oldest restaurant in Florida. Great food, great service, and great flamenco show (which I’d never seen before). Slept horribly last night, so I can’t wait to get on the plane and take a nap. I made the foolish mistake of checking my alarm before I went to sleep. Or not so foolish since I had set it for 5 pm, not 5 am. I fixed it, but then I woke up all night long, convinced I had missed it and terrified I was waking up at 7 am, far too late to make my 7.35 flight. But I wasn’t just responsible for my own wake-up. I also had to wake up my travel wife, who sleeps very heavy. Her TV had been on all night, and I think it was louder than I was. I tried banging on the door one more time, pretty sure I was going to wake up all the neighboring rooms. Then I did It. I went into her room. And she was toasted out, completely oblivious. What next? I didn’t want to touch her. I tried calling her name again. No dice. Maybe I should find the remote and turn off the tv? Couldn’t find it, and the tv had no obvious buttons on it in the dark – the curse of modern technology. So I fell back to an old favorite. I hit her with a pillow. Now we’re at the Tampa International Airport, the TSA agent manning the desk gave my id and ticket the stink eye, like they was suddenly going to transform or tell him I wasn’t me, and we’re collapsed at the gate, waiting to board the flight and take a nap. This is it, my final day in Tampa. There are a few things I’ve discovered. 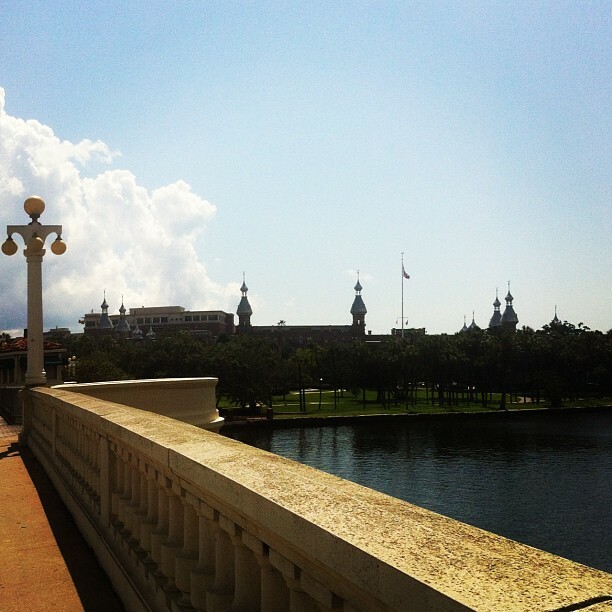 In Tampa, I walk. I sweat. I pant. I live in a one mile square radius. I see the world and save it in pictures and a sense of unreality. I think there’s nothing like it in Texas, but I’m wrong. It has homeless people, and rude people, and nice people, and good food, and heat, and the threat of a tropical disturbance. I’m tired, and headachy, and have been stuffed full of knowledge and writing skills and new experiences. And I’m ready to go home. And come back in January. Not Quite Urban Explorer Day! So my travel wife, we’ll call her “Alessandra” for the sake of anonymity, decided to come along with me to one of the evening readings. It was the first time that we’d be driving to the campus with the intention to actually park in the garage. It was hard to find, and once we’d found it, we then had to fight our way through the rubble of construction and bush-whack from the back end of the campus to find the theatre where we’d get to hear the reading of one very boring presenter book-ended onto one of the most engaging readings of the series. And they were creepy! They didn’t look like anyone was coming back to them. Bookcases against windows. Mattresses leaning on walls. Empty, darkened game rooms and Laundromats with unopened boxes that made it look like everything was in suspended animation. 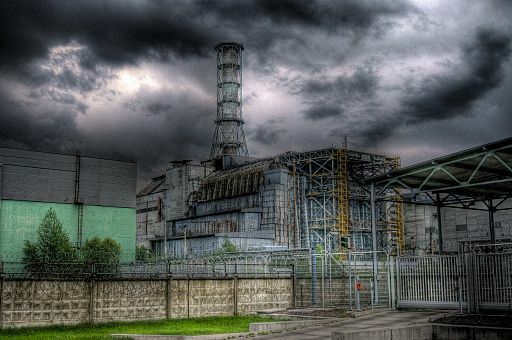 It made me want to watch Chernobyl Diaries (no spoilers – I haven’t seen it yet!). The next day, when I was leaving the Books Arts Seminar, I was traveling with a fellow student back past the garage and onto campus. For her anonymity, I’ll call her “Trusting.” So Trusting was kind of lost, having never been behind the garage and off campus like that before, and I say, “Hey, let’s cut through this deserted part of campus that’s deserted and spooky!” And she, not knowing me at all, says, “Sure!” Because she’s obviously never watched a horror movie. 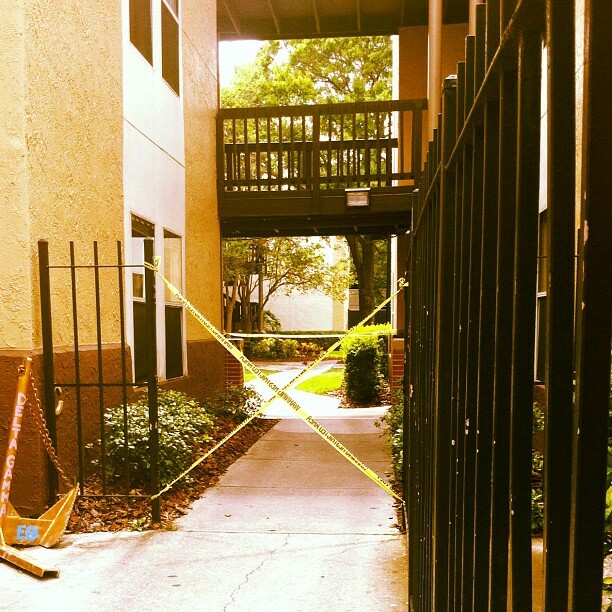 Well, luckily for Trusting, it wasn’t a horror movie, but at some point between the previous night and that afternoon, someone put up “Caution” and “Restricted” yellow tape in a big X, trying to stop anyone from exiting – but not entering, which was really strange. We had to cross through the X to get out. And in that moment, I flashed on the movie I’d seen about urban explorers, and something tripped in my brain, and I was no longer content looking at pictures and videos of urban exploration, I got the urge to do it. The person in the movie was right – there’s totally something that makes you want to go wherever you aren’t supposed to go. If I didn’t have a witness with me, and if the security cameras weren’t as blatant as they were, perhaps I would have tried some doors and windows. Instead, I think that flush of excitement is what led me to agree when the MFA program assistant, let’s call her “Flunkie” for this, pulled up in her golf cart and offered us a ride to the edge of campus, right next to the drawbridge, to help reduce our walk. It was starting to drizzle. We both said yes. Since I had two bags (my computer bag and my purse), I took the back bench that faced outwards. It was the scariest carnival ride ever. No, there was no fear of it being old and creaky, but it was fast and felt out of control, hitting every bump of the bricked drives, swerving at the last possible moment, and hopping the curb (“Ooops,” Flunkie said), and missing a turn because she called out and waved to her friend on the porch of Plant Hall, losing track of her driving (“This is fun, kids!” she said, missing – or finding it ironic – that we were both almost twice her age.). We got off and I won’t bothered with the clichéd weak-kneed, but I did feel like I had just survived a near-death experience, having spent most of the trip picturing myself flying out of the car and into a face plant with maximum injury and maximum bloodshed. And then it got even more fun. As we walked across the bridge, it went from a drizzle to a cloud burst. I walked my mile back to the hotel with squishy sneakers, dripping wet hair, and a waterproof bag that leaked. 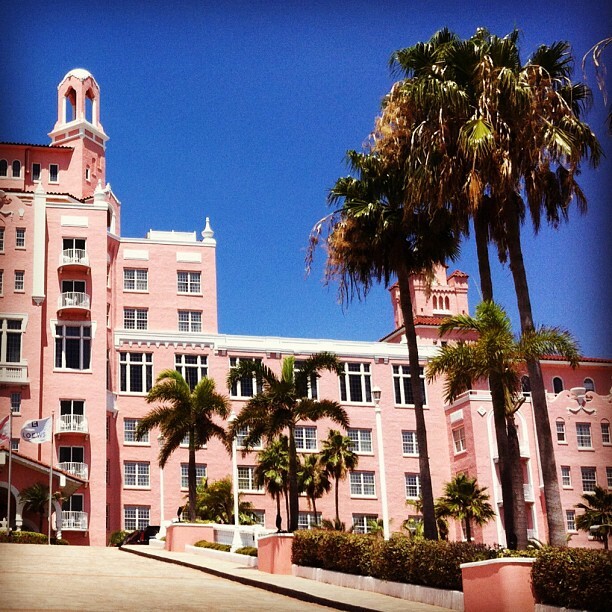 It was a day trip – we were going to gather at the Don CeSar Hotel on St. Pete’s Beach and have a workshop. Not quite the Algonquin Roundtable, but a chance to check out something new, see the beach (Tampa’s the bay, but there’s no beach near the campus), and then see the new Dali museum that open in January of 2011. My travel wife (let’s change her name for this one – we’ll go ahead and call her “Sandy”) came along, and we headed out early to get coffee and in case we got lost since neither of us knew where we were going. The hotel was pretty, and the beach was pretty, but the place was somehow still odd and off, and when it came time for lunch, we snagged the car as quickly as we could and headed back up the highway and to St. Petersburg. St. Petersburg is what Galveston wants to be. A thriving harbor, tons of tourists, and upscale shops by the dozen. But parking sucked. Sandy found a tapas place, and after finally finding a place to leave the car at a meter, we got to the restaurant. Great food, but slow service, and Sandy discovered that all the public drinking water had an unpleasant undertone to it. I couldn’t taste it, so she was probably just imaging it (joking). The most important part of the meal, though, was the plate situation. She shrugged, nodded, shook her head, and brought back a blue plate. Score one for crazy people! The Dali Museum was awesome and inspiring, but completely packed! We ignored the rules – very Dali, right? – and made ourselves pipe cleaner mustaches in the “children’s area” (cause aren’t we all children at heart? Right?). Then it was back to the hotel in Tampa, and a hop, skip, and jump into the pool to recover from the day of semi-relaxation. I tried to start out the day light and got a ride to UT. Good idea. But then I chose to walk back to the hotel at lunch. Not such a good idea. In fact, perhaps a straight out bad idea. Because first, I had heavy bags. Second, it was hot. And third, as I walked across the drawbridge, I heard a metal-on-metal jangle. I didn’t see anything, even though I stopped and looked, and I kept going. I got back to the hotel – hot, tired, and realizing what the noise was. My best pen. My most expensive pen. My newest pen. My lovely lovely Cross Spire that I had just gotten during my trip to Milwaukee. It had been attached to my binder. Yet somehow it had unscrewed itself as I walked, and all I had left was the lid, still firmly attached. Lots of wailing and moaning on my part. Complaining. Insert your own –ing verb here. But it was lunchtime. And life could still be worse, right? So then my travel wife (we’ll keep on calling her “Sandra” for this third and final installment) discovered that there was a church gift shop in the neighborhood. And, honestly, who doesn’t want to go to a church’s gift shop? We went, and I found a necklace with Saint Dymphna on it. I had never heard of her. But apparently she’s the “Patron of Those with Mental Illness.” The little pamphlet tells us that she was the daughter of a chieftain whose wife died. He went crazy, got hot for his daughter, and she ran away. He followed her, made advances, and she refused so he chopped off her head. I’m not quite sure how that makes her a patron saint for the crazies, but it didn’t matter. I knew I needed it. My pen was making me crazy for sure. I bought it and tucked it into my bag. Then it was back to UT. It hadn’t fallen all the way through the slats. It was somehow still there, wedged in, but visible to anyone who was scanning the silver metal. So was it my patron saint looking out for me? Or just the fact that people don’t look down? Either way, I got my pen and my patron saint. And I’m still in Tampa. Now, I have to pause here to make two statements. 1. I hate Florida. Hate it. 2. I hate cities full of interlocking one-way streets. We were trying to stay at the Marriot Residence Inn and Suites. Which was, of course, both in Florida and on a one-way street. It seemed to be a block wide and a block long with entrances on both sides. But one side had a valet. We were tired. The car was full of luggage and ten days worth of groceries. A valet was perfect. So we circled the block. A ten minute driving exercise, thanks to the lovely one-way roads all over. But when we pulled up in front of the hotel at the valet stand (which was now standing empty), the sign said it was a Marriot Courtyard. I parked at the curb, flipped on the emergency flashers because, at this point, it was totally an emergency that we stopped – and went in. “Please tell me we’re at the right place,” I said to the front desk clerk, handing her my paperwork. She shook her head, and I noticed that it looked like there was construction between the buildings. Back to the car. Another ten minutes of driving. No valet. We got checked in, and my travel wife (who we’ll continue to call “Sandra”) unloaded the car onto a cart while I got everything set. We unloaded, and then I went to park the car across the street. By the time I got back to the room, she had set up dinner and put the groceries away. Excellent travel wifery! But then we realized that there was no balcony. The front desk clerk had told us that we’d have one. How odd. We checked our rooms again, and that’s when I discovered that my tiredness had worked against me. I’d picked the wrong room. The one I picked was smaller – no desk, no balcony. I demanded an immediate switch. I’d gotten stick in a crappy room during the last convention I’d gone to, and it wasn’t going to happen again. So despite being called an Indian giver multiple times (no matter how often I protested that it was politically incorrect), I dragged the bags back and forth to get the good room. But then I had to catch up on my day of roller coasters. I’d gotten a payment for some of my writing. And I’d gotten a call back for a job interview! But the payment was under $5. And the job interview was for while I was in Tampa. Right hand gives. Left hand takes away. But that was all okay because I’d be starting my MFA the next day.